Your guide to the smartest thing on internet television. Made possible by the members of IEEE, IEEE.tv is an award-winning, Internet-based television network which produces and delivers special-interest programming about technology and engineering. On IEEE.tv you will find a library of more than 800 programs on such topics as wind power, biomedical engineering, recycling computers, electronic products and much more. New programs recorded in high definition are added monthly. The 2nd annual IEEE Global Humanitarian Technology Conference (GHTC 2012) attracted over 250 attendees to Seattle in October, bringing together individuals from 22 countries who are working to improve the lives of the billions of people around the world living at the bottom of the economic pyramid. Robert Freling, Executive Director of the Solar Electric Light Fund (SELF). SELF is a leader in providing practical and cost-effective renewable energy alternatives for the developing world. Gertjan van Stam, delivers a stirring keynote address on the challenges facing Zambia and his take on possible solutions. Jim Fruchterman, a social entrepreneur and CEO of the nonprofit technology company Benetech. Jim believes that technology is the ultimate leveler, allowing disadvantaged people to achieve more equality in society. Krista Bauer, the Director of Global Programs for GE Company. Watch addtional GHTC 2012 Session coverage on IEEE.tv. IMS 2011 MicroApps - "Advanced Terahertz Device Characterization," presented by Keith Anderson, Agilent Technologies. Watch technology writer, Evan Ackerman, become the first person in the United States to take the robotic legs of the Hybrid Assistive Limb (HAL) exoskeleton for a test walk. NIRo, a demonstration platform built by engineers at National Instruments, is a small unmanned ground vehicle that uses off-the-shelf components purchased from a local hobby store. Learn how you can design a simple robot with NI LabVIEW. Ethernet in the First Mile: Access for Everyone is a book that goes into the understanding of extending Ethernet into the domain of subscriber access networks. Managing Projects in Telecommunications Services is for anyone interested in the telecommunications services field - experienced or not. Author Mostafa H. Sherif believes that this book is beneficial because it explains the unique requirements of telecommunications projects and goes in depth on project management in the field. There is no better time to discover the value of IEEE membership! The 2013 membership has started. That means when you join IEEE now you receive full membership benefits through December 2013! Learn more about the benefits of IEEE Membership or join now. 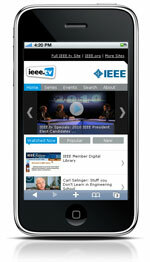 IEEE.tv has released a mobile app for Android and Apple iOS devices to allow IEEE.tv viewers to watch content on the go. The app is available for free for all devices and includes some great features. Included is the availability to search for content in the vast video library, member login access, and easy sharing of programs. This app is available by visiting the Android™ Market or the iTunes App Store.